ThruVision suicide vest-detection technology reveals an suspicious object on a man, at left, during a TSA demo in Penn Station. Madison Square Garden security has been secretly using facial recognition software to scan spectators’ faces, the New York Times reports. This would make MSG the latest space to be using face-scanning tech on an unknowing public. The MSG arena hosts concerts and performances from A-list stars and major sporting events, including basketball, hockey, and boxing, with a maximum capacity of 20,000 guests. Citing only unnamed sources, the report is sparse on details like when the software was apparently installed or how many peoples’ faces have been scanned. 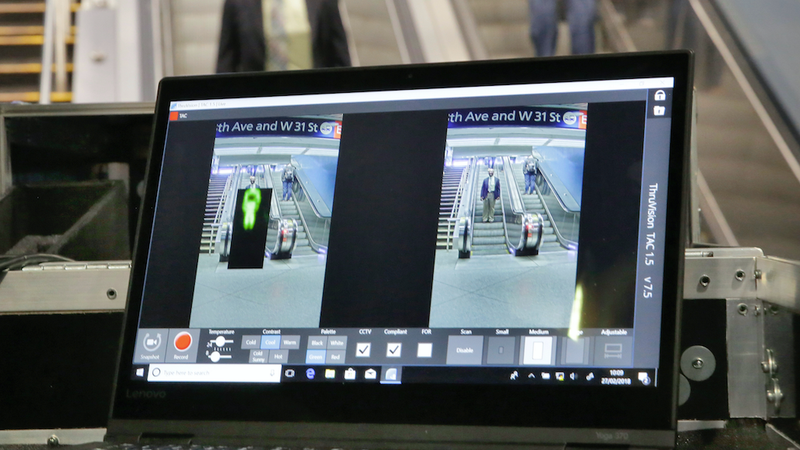 Face recognition software, used everywhere from Olympic stadiums and public schools to KFCs and airports, is becoming more common and less visible. In 2016, researchers at the Georgetown Law Center on Privacy and Technology found that the Federal Bureau of Investigation had built a massive face recognition database, amassed from drivers’ licenses, passports, and mugshots. Sixty-four million Americans are in the database, with the overwhelming majority unaware they were involved at all. Similarly, Georgetown lawyers filed suit earlier this year against the New York Police Department for withholding details of a face recognition program that’s been in effect. In all these cases, including MSG’s reported system, face recognition is used on the public, who are then informed of the practice long after the fact—usually after lawsuits. MSG declined to confirm or deny the face recognition system, and instead offered Gizmodo the following statement: “MSG continues to test and explore the use of new technologies to ensure we’re employing the most effective security procedures to provide a safe and wonderful experience for our guests.” The Times sources didn’t describe what database spectators are allegedly checked against, where those images came from, or, crucially, what happens if someone is flagged using face recognition. In the case of an arena, a sports fan might sign up for a loyalty program with a team and attach their image and a credit card to the account. They could then park without paying an attendant, walk in without having a ticket scanned and pay for merchandise and concessions without ever taking out their wallet. If that sounds familiar, it’s because airports in Miami, New York, and elsewhere across the country are rolling out face recognition under the guise of convenience. Civil rights groups like the American Civil Liberties Union have long rallied against face recognition because they mean simply showing your face in public becomes an interaction with law enforcement; you’re scanned and potentially checked against a criminal database. Civil rights groups argue this process elides privacy protections against search and criminal suspicion, but there’s little that can be done when the public doesn’t even know they’re being scanned.